Women’s Equality Day, which will be celebrated Saturday, commemorates the day the 19th Amendment was certified to the Constitution in 1920. The amendment granted women the right to vote, but the observance of Women’s Equality Day is not just about celebrating how far we’ve come. It’s about recognizing continuing efforts toward full equality of the genders. 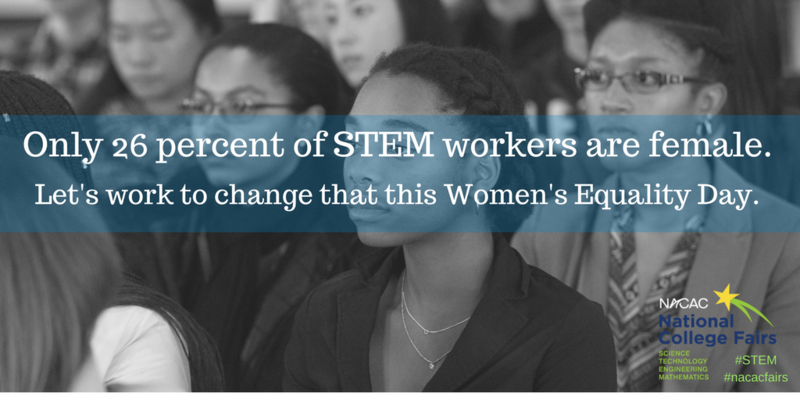 American women are still underrepresented in many professions, including the STEM fields of science, technology, engineering, and mathematics. Over the past several decades, women have made strides in some STEM careers, according to the US Bureau of Labor Statistics. Female participation in the medical field, for instance, is about equal to that of men, according to the data. But in other fields, the numbers are shockingly low. For example, women comprise just one-fourth of the workforce in computer and mathematical jobs and hold only 14 percent of jobs in architecture and engineering fields. NACAC’s STEM College and Career Fairs — open to students of all genders and backgrounds — are hoping to help close that gap. In 2016, female students accounted for 49 percent of fair attendees. This year’s STEM College and Career Fairs will be held in Silicon Valley, New York City, and Houston during October and November. In addition to featuring colleges with STEM majors, representatives from STEM-related industries will also be in attendance to speak to students about internship opportunities, their future careers and how best to achieve their dreams. At the Silicon Valley fair, NACAC will host a panel on the STEM gender gap. Titled, “The Need for Diversity in STEM Fields: How Females and Minority Students Can Find Opportunities,” a panel of STEM professionals will discuss their varied professional journeys and offer tips for students to start their own career paths.